We strive to use only sustainable textiles in our collections. It is estimated that about 80% of a product's environmental impact is determined in the design phase. We strive to make the most sustainable choices in our whole value chain, thus our design is created from the eco friendly textiles we discover around the world at our amazing suppliers. We have described each textile below and written why we think it is a sustainable textile choice. Our bamboo textile is made from bamboo grown in organic bamboo forests without the use of harmful chemicals. Its surface looks and feels like silk. Bamboo, which is botanically categorized, not as a wood species but as a kind of grass, can if handled right, be a very sustainable resource and can grow where food crops can't. Bamboo is the worlds fastest growing grass species and can grow more than a meter per day. The raw fibres are OCIA, NOP and FSC certified. The bamboo fabric is Oeko-tex certified. Used in: Our Bamboo fabric is used as lining in various of our styles such as Rikke Pants, Anna Skirt, Frida Coat, Gitte Skirt, Margrethe Jeans and Ingrid Coat. Banana fibers used in textiles are derived from waste products from the food industry. After the bananas have been harvested, the tree stems are cut. The separate sheaths in the stalk are first removed by chopping. The fibers are removed from the cut stems in a decortication method. The threads are extracted by crushing the stalks with a roller and excess threads and plant tissue are scraped away. The threads are then boiled, washed, dried and carded to be prepared for spinning on a traditional spinning wheel. The threads are wet during spinning in order to avoid breaking. In the preparation of the banana material there are not used any Azo enzymes or GMO grown banana plants. The energy and water consumption is minimal, compared to other natural materials. The fabric is all natural and thus unbleached and undyed. Banana plants do not require pesticides and fertilizers when grown in tropical climates, and is grown by small farmers who own their own land. The banana fibers in this material is completely hand-made, from the extraction of fibers to the spinning and weaving of the yarn. Since banana textiles do not involve chemicals in the material extraction process, the fabric is completely biodegradable. The material is almost 100% carbon neutral. The banana fabric is created by a small artisan community in Nepal who continue to pass their skills down to younger generations and thus maintain ancient traditions. The banana material is registered by a Nepalese NGO and is WFTO certified. Our handwoven cotton textiles are made in a small village in northern Thailand. The weavers buy their cotton yarn from local farmers which, currently, is conventional, GMO-free cotton. Afterwards, they dye the yarn using natural plant dyes. The plants that create our beautiful colors, are all found locally and harvested sustainably, without using chemicals. The weavers spin the cotton yarns on a traditional weave. It takes about 3-4 hours to weave one metre fabric. There are not used any azo enzymes, VOC or GMO in the preparation of the material. In addition, the energy and water consumption is held to a minimum as it is all done by hand. The material is naturally colored, and thus has a low impact on the environment. Gritt & Borris cooperates with the company that started this textile production project as a cooperative with the village. The project ensures fair wages for the workers within the village's textile production. 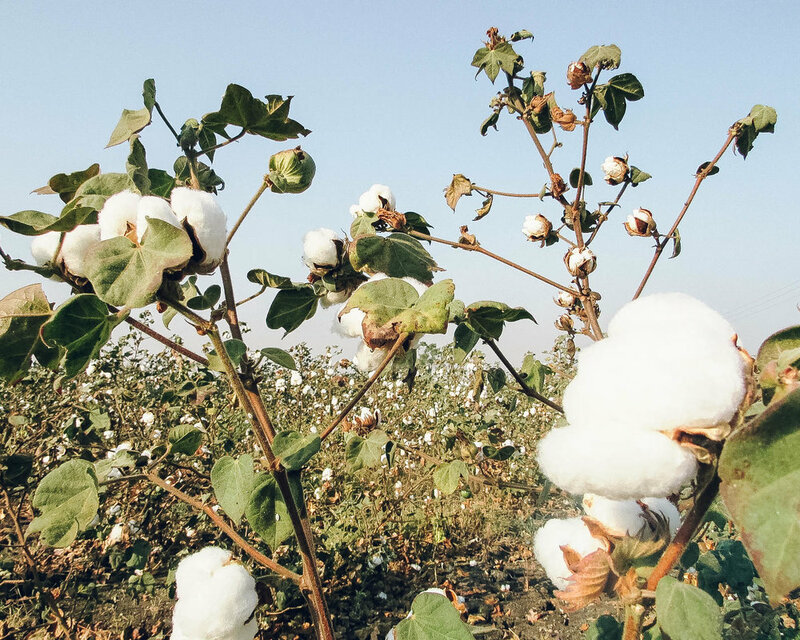 Organic cotton is derived from the cotton plant and grown using methods and materials that have a low impact on the environment. Importantly organic cotton farming does not allow the use of toxic chemicals or GMOs (genetically modified organisms). Third­-party certification organizations verify that organic producers use only methods and materials allowed in organic production. Organic cotton is grown without the use of toxic and persistent pesticides, herbicides and synthetic fertilizers. Furthermore it is hypoallergenic. It does not cause any allergy or irritation when it touches skin. Our organic cotton styles has either been dyed with GOTS certified dyes or plant dyes. Used in: Our organic cotton comes as jersey, denim, voile, satin and more. It's used in styles such as Marie Dress, Oda Skirt, Alma Dress, Grethe Top, Rige Shirt, Kaja Shirt, Rikke Pants, Anna Skirt, Agnete Dress, Clara Shirt and Margrethe Jeans. Recycled cotton can derive from pre-consumer and post-consumer textile waste. With post-consumer waste the textiles are devided into smaller pieces before pulling them apart into fibers. The fibers are carded several times in order to clean and mix the fibers before they are spun into new yarns. Recycled cotton is often blended with organic cotton fibers to improve the yarn strengths, as the recycled cotton's staple fiber is of shorter length and thus more difficult to spin. Recycled cotton saves both water, chemicals and energy as it is made from already existing textiles. Flax Linen is a very sustainable fibre. When grown in its ideal geographical zone, the cultivation of flax linen produces no waste. All parts of the flax plant are used: the long and short fibres and seeds are made into textiles, paper, varnish, oil, animal fodder and bio-materials. After the plants have been harvested, the root remnants fertilise and clean the soil, thereby improving the productivity of soil for 6 to 7 years. Growing flax requires no irrigation, no fertilisers and no herbicides and pesticides, and therefore does not pollute rivers or groundwater. Flax even retains 3.7 tons of CO2 per hectare per year. All of our linen is dyed in fully compliant with the European REACH standard and are Oeko-Tex certified. Our Linen is made in Belgium. Used in: Freja Coat, Sanne Dress and Nelle Pants. Our recycled polyester, also called rPet (recycled polethylene terephtalate) stems from plastic bottles used for packaging. Instead of going to a landfill, the plastic bottles are collected, cleaned and transformed into polyester. The process requires 33-53% less energy than conventional polyester. In addition to saving a lot of energy, recycled polyester reduces our dependence on petroleum as recycled polyester is made of materials there are already in circulation. Using PET bottles for this process also reduces landfill and by extension soil contamination, air and water pollution. Tencel is a recently improved version of the generic fiber Lyocell. Tencel is made from 100% cellulose from the eucalyptus tree. The eucalyptus trees are the fastest-growing trees that does not require irrigation or pesticides. To make the textiles, eucalyptus trees are felled and made into chips. The wood chips, mixed with water and amine oxide, makes the chips dissolve and form wood grain.The wood pulp is processed to fiber form, after which the fiber is washed, dyed and finally spun into yarns. Tencel is produced in a closed circuit, where almost 100% of the amine oxide and water can be recycled. Also the MSDS states that the amino oxide used in the process is non-toxic.Therefore, there is minimal amounts of waste in the process. Tencel can be reused and is 99% biodegradable. The eaucalyptus trees are in grown in FSC and PEFC certified forests. Our organic wool xomes from a combination of two different kinds of sheep, where 70% of the wool comes from the Texelaar sheep and 30% from the Zwartbles sheep. The wool originates from the Netherlands, namely between Amsterdam, Utrecht and Leiden. The wool is undyed and gets its color directly from the two sheep breeds. The white wool in the mixture comes from Texelaar sheep, while the brown wool comes from Zwartbles sheep. The fabric is 100% pure wool and is twill-woven. The fabric has a brushed surface which gives it a felted look.